Primary schools need a comprehensive approach to managing bullying. This manual provides all the information your school needs to put together a successful program that addresses bullying at all levels and helps develop policy and processes for whole school intervention. OR WAIT! SPECIAL OFFER!! For a limited time BUY BOTH the BULLYGUARD PROGRAM for primary students, normally $45 and the PRIMARY MANUAL, normally $60 for a special offer price of $90. Download immediately. 7 days money back guarantee. (CONDITIONS APPLY). Secondary schools need a comprehensive approach to managing bullying. This manual provides all the information your school needs to put together a successful program that addresses bullying at all levels and helps develop policy and processes for whole school intervention. The BULLYGUARD program offers an individual workbook to assist primary children to develop skills and goals to help them in recognising and resisting bullying. It also includes an information booklet to assist in understanding bullying and the Selfguard log to help keep track of incidents. The booklet can be used by parents or teachers to work with victims of bullying or help children who are bullying others. 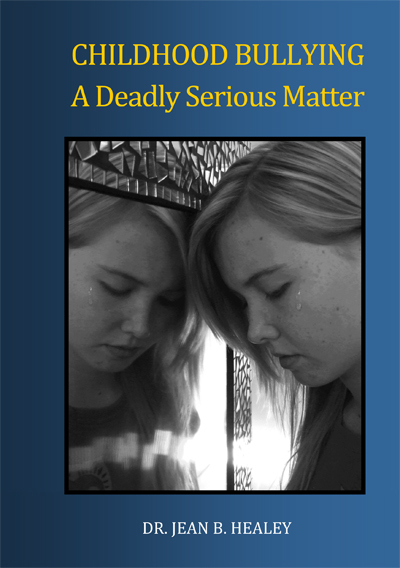 ‘Childhood Bullying: A Deadly Serious Matter’ by Dr. Jean B.Healey is a text presenting a unique perspective on bullying as a child abuse issue and suggestions and resources for intervention. The text covers school and individual bullying, cyberbullying and the continuum of abuse that leads to serious distress and even suicide in young people. Research -based and controversial it offers new concepts and ideas for understanding the issue.